The last time I cooked this dish was when hubby and I were looking for mini portables, but we end up buying a second-hand laptop instead. Anyway, Crispy Pata (deep-fried pig’s leg) is easy to cook. Whole pig’s leg (pata), water, pepper corn, salt, bay leaves, vetsin, fish sauce (patis), flour, oil. Thoroughly wash pata. Place in a cooking pot with water. Add in salt and vetsin, peppercorn and bay leaves. Cover and cook until tender. Let it dry for a while before deep-frying. Before frying, rubbed it with patis and flour. Cooked in medium heat until it becomes crunchy. Best served with steamed rice and yummy dipping sauce. Dipping sauce: vinegar, soy sauce, a pinch of sugar, chopped garlic and siling labuyo. 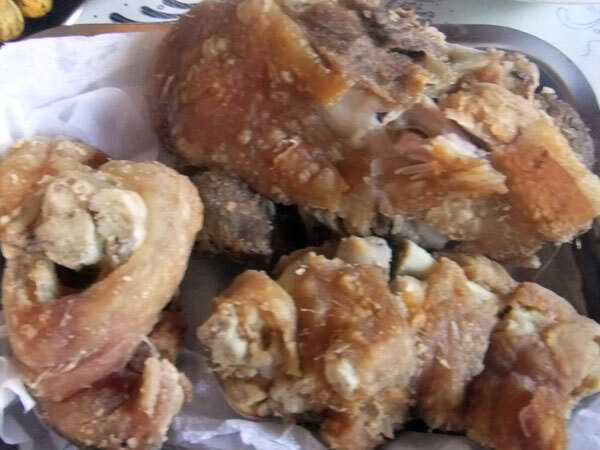 This entry was posted in Favorite Food and tagged crispy pata on December 6, 2011 by Yami. I love crispy pata if we could eat nga lang everyday eh pero ingat ingat din ako sa cholesterol.